My Weight Loss Bucket List: So Many Changes...or...The Blog Post that Reignited the Passion! So Many Changes...or...The Blog Post that Reignited the Passion! Wow, I can't believe I haven't blogged in over three months! Normally, for weight-loss bloggers, that is a sure sign of significant problems. While I can't deny that my time away has been full of ups an downs, I am happy to report that I haven't COMPLETELY fallen off the bandwagon - my healthy goals have just been much more hit or miss lately than I would like to admit. After changing states, quitting my job, looking for new jobs, being hopeful, rejected, hopeful, rejected, and ultimately being frustrated that my journey has not gone how I originally planned, I find myself finally coming to terms with the fact that it is time to refocus! Have you ever had a friend that uses every excuse in the book NOT to do something? Have you ever BEEN that friend? That's who I've been lately. Ohhhh, I've been so BUSY packing and moving and unpacking to work out. I've blown my set way of eating, I might as well continue indulging myself today/this weekend/this week/this month and start again "soon". 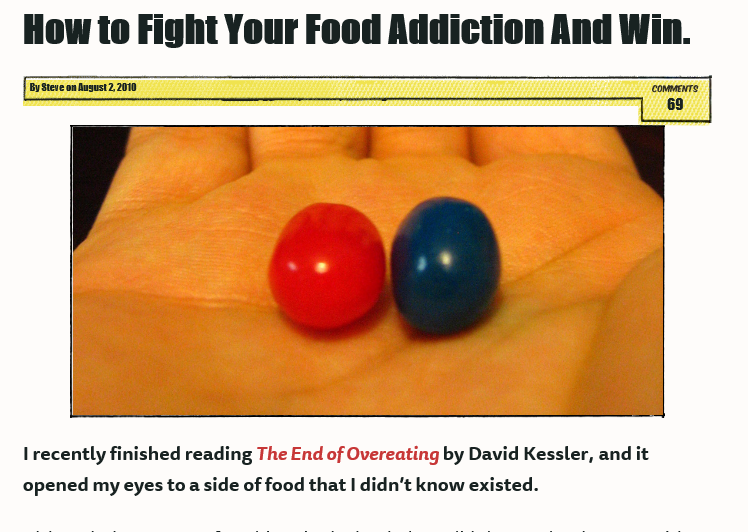 Seriously, go read this now if you think you will EVER need motivation to keep doing the right things with the food you eat. I hate to even summarize his post, but basically he compares us to being Neo in The Matrix, and talks about how we can choose to live in the jail that says that eating junk is comforting and satisfying, or we can live in the truth of how what we eat is affecting our life. What's a lie you constantly tell yourself to keep yourself in your food/lack of fitness "jail"? Besides the ones noted above, my top one is Blowing off one meal/workout will not impact me THAT much. Anyway, this four-year-old blog post was enough inspiration for me to come back to my sadly neglected blog, and I'm hoping some of you in the blogosphere can be inspired as much as I was!